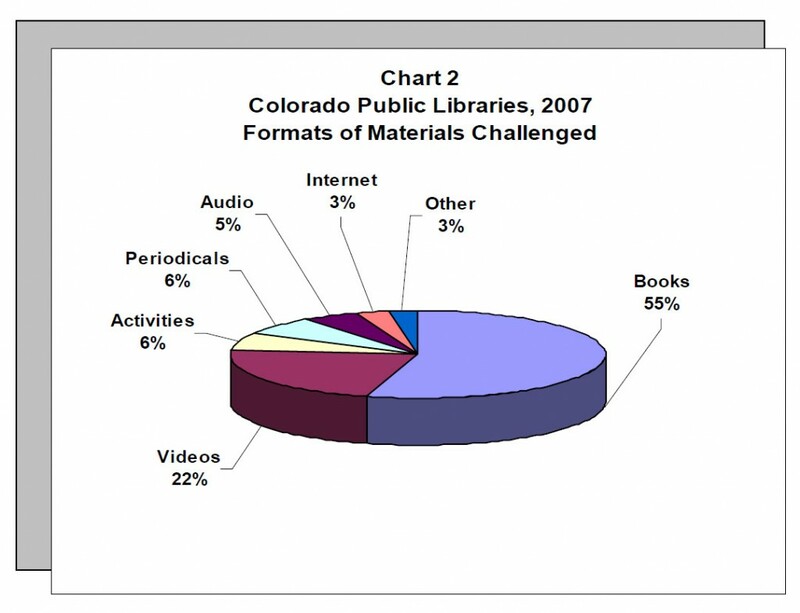 In 2007, 16 of the 115 public libraries in Colorado reported challenges to materials and the Internet on their annual survey. There were 78 separate challenges to books, audio books, library events, Internet sites, periodicals, videos, and displays. While the number of challenges in 2007 is higher than the previous year, it is not as high as the number of reported challenges in 2004 and 2005, which numbered 86 and 84, respectively. 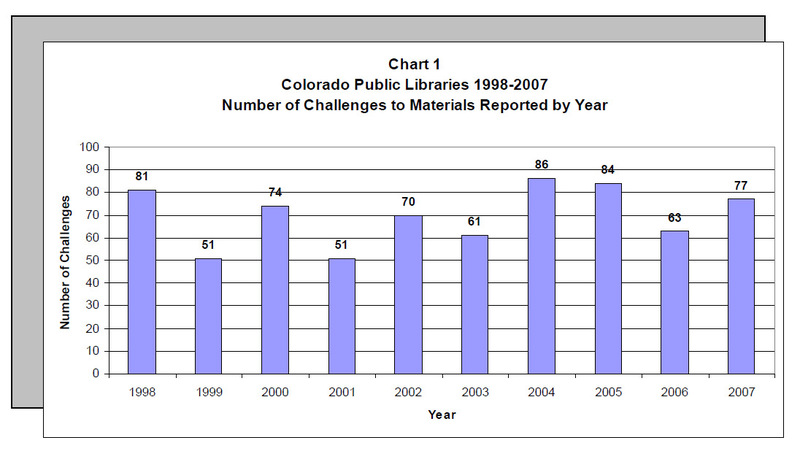 Over the past 10 years Colorado’s public libraries have averaged 70 challenges to materials annually (see Chart 1). The LRS sent a follow-up survey to the libraries that reported challenges last year and all but 1 library responded with more detailed information. Libraries were asked the title, author, format of the challenged item, the reason given for the challenge, the action taken by the library, and the date of the publication or, in the case of an Internet-related challenge, the date the challenge was initiated. LRS shared this information with the American Library Association to contribute to a comprehensive picture of library challenges nationwide. As has been the pattern over the past several years, the most challenged format in 2007 at public libraries was books, which comprised more than half (55%) of the total number of challenges. Videos made up over one-fifth of the challenges (22%). Only 6 percent of the challenged items were library activities or periodicals. Other materials comprised less than 6 percent of all challenges (see Chart 2). The majority of the challenges (77%), resulted in no change being made in the location or availability of the item (see Chart 3). Thirteen items (17%) were moved to another part of the library or to another branch. Two of the challenges were dropped (3%) and 2 items were removed from circulation (3%). One challenge that involved an Internet access issue resulted in modification of the Internet filter. The follow-up survey asked respondents to select 1 or more audience/age groups for the material being challenged. 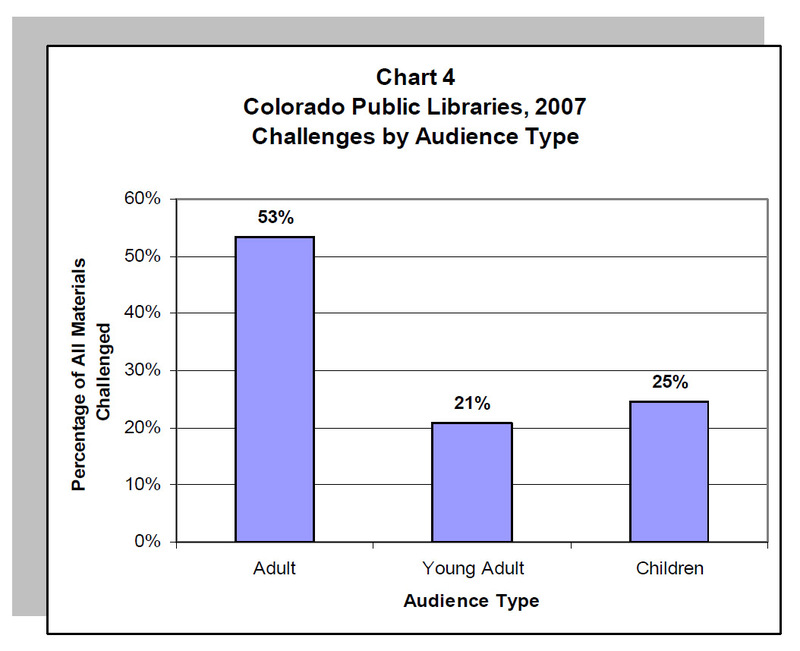 In 2007 libraries answered that more than half (53%) of all challenges were to adult materials (see Chart 4). 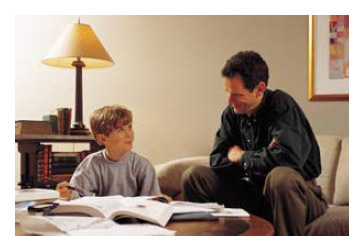 A quarter of challenges (25%) were for children’s materials and one-fifth of challenges were for young adult (21%) materials. The most commonly cited reasons for challenges in 2007 were for items that were deemed sexually explicit, unsuited to age group, or containing violence (see Table 1). Respondents could select several reasons for each challenge. 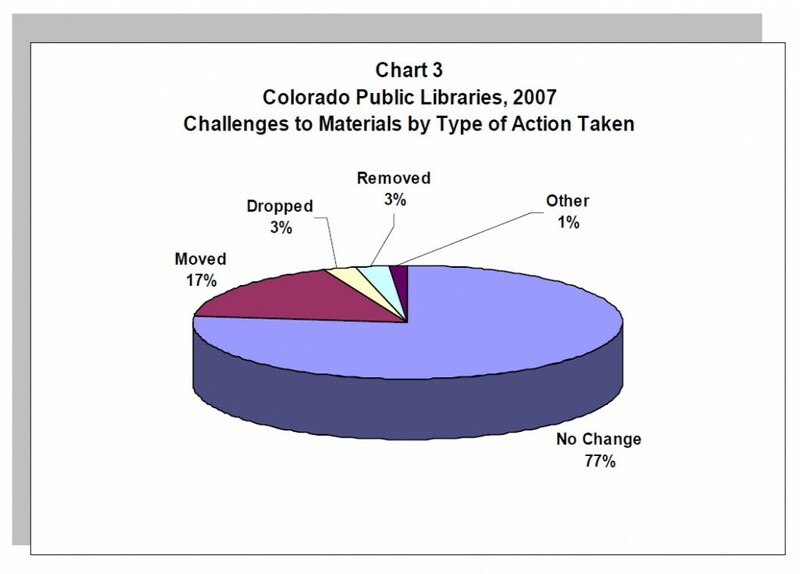 Challenges to Materials at Colorado’s Public Libraries: http://www.lrs.org/pub_stats.php. Colorado Association of Libraries’ Intellectual Freedom Committee: http://calwebs.org/committees6_2.html. American Library Association, Office of Intellectual Freedom’s Frequently Challenged Books page: http://www.ala.org/ala/oif/bannedbooksweek/challengedbanned/frequentlychallengedbooks.cfm.